It has all the things you would expect from a great keyboard — GIFs, emojis, and Glide Typing — plus Google Search built in. No more app switching; just search and send, right from your keyboard. 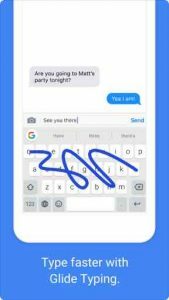 We know the things you type on your phone are personal, so we’ve designed G board to keep your private information private. G board sends your searches to Google’s web servers to give you search results. G board also sends usage statistics to Google to let us know which features are used most often and to help us understand problems if the app crashes. If you use G board’s microphone, voice input will be sent to Google for transcription. Other than your searches and voice inputs, G board doesn’t send anything you type to Google, whether it’s a password or chat with a friend. To help you with spelling and to predict searches you might be interested in, Gboard will store the words you type on your device. This data is not accessible by Google or by any apps, and can be cleared at any time. If you’ve turned on contacts search in G board search settings, this allows G board to search the contacts on your device so that you can easily share. None of these queries is sent to Google.